Emilia in the play “The Two Noble Kinsmen.” By W. Shakespeare & J. Fletcher. Most think of roses as that sweet summer flower that graces a flower bouquet. History is filled with legend and lore about roses. A symbol of true love, rose water was added to beverages and petals were scattered at weddings to ensure a happy marriage. Roses are also used as a component of meditation and prayer. The petals ground and made into a pulp are used to make rose beads to string for rosaries. The herbal side of roses include use as medicine, flavorings and perfumery. Slightly, sweet lingering perfume for syrups, jams and vinegars. Use in beverages, salads and baking. The essential oil in the rose petals is said to heal depression, nervous stress and tension. The petals infused into water, honey and natural skin oils are used as a skin softening treatment. Roses have a humectant quality that helps skin to hold moisture. It is used in lotions and oils to soften skin and lessen damage that cause wrinkles. Roses are one of the most popular ingredients in both dry and moist potpourris. The intense fragrance in the petals holds well through the drying and preserving process. Lovely in combination with lemon verbena leaves and lavender buds. 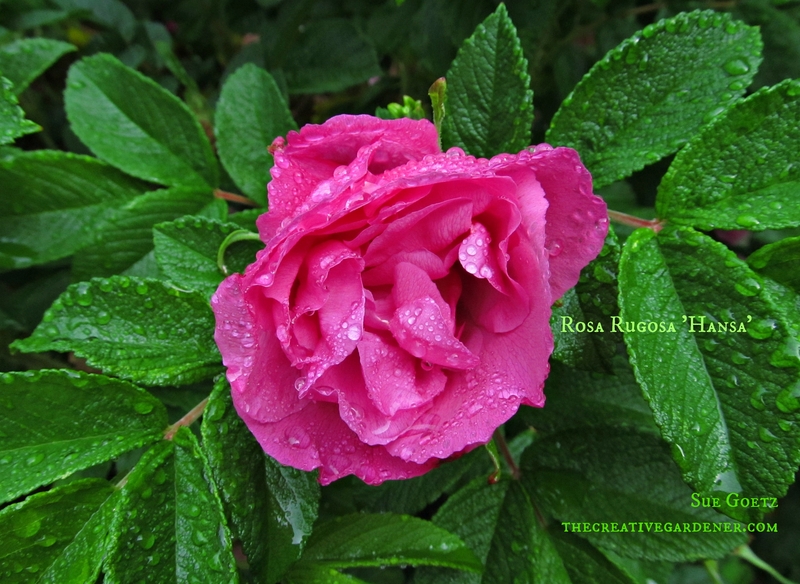 Rose bushes that produce abundant flowers through the growing season with intense fragrance are the true herbal roses. Ancient varieties cultivated specifically for perfumery include Rosa damascena and Rosa centifolia. Rosa gallica var. officinalis is known as the true apothecary rose because of its historical use in healing remedies. Rosa rugosa and many other old-fashioned shrub roses are good varieties to use because they are disease and pest resistant and produce for long periods of time in the growing season. Rosa ‘Frau Dagmar Hastrup’, Rosa rugosa ‘Hansa’, Rosa rugosa ‘Blanc Double de Coubert’, Rosa ‘Rose du Roi’, cabbage roses (Rosa centifolia) such as the hybrid variety ‘Rose de Mai’, damask roses (Rosa damascena) varieties, ‘Madame Hardy’ or ‘Rose de Rescht’, ‘Apothecary’s Rose’ (Rosa gallica var. ‘officinalis’), Rosa Mundi (Rosa gallica ‘Versicolor’). Highly fragrant modern day roses include Gertrude Jekyll, Brother Cadfael, Harlow Carr, and William Shakespeare 2000. Please Remember! All roses for any herbal use must be grown by organic methods. Do not use roses purchased from a grocery store or non-organic florist, they are typically treated with chemicals. The faster you can get a rose petal to dry the better it will hold its color and fragrance. That said, do not expose them to a heat source like a dehydrator. The heat will release the oils rather than preserve them. Place fresh, clean rose heads on a drying screen and place in a warm space that has no direct sunlight or heat source. If there is high humidity use a fan to circulate air around the drying screens. When they are completely dry, break the petals away from the base of the flower and store the petals in a glass jar. Roses do not give up their oils readily, making it one of the more expensive essential oils on the market. It can take up to 10, 000 lbs. of rose petals to extract 1 pound of oil. Some flower varieties like Rosa damascena, takes about 30 individual rose blossoms to make 1 drop of oil. A hint of jasmine in green tea, tossed with rose petals makes a heady perfumed tea perfect for afternoon tea time. Bring two cups of water to a boil, remove from heat. In a warmed glass teapot add 2 teaspoons jasmine green tea and rose petals. Pour steaming water over the rose/tea mix and allow to steep for about 7 minutes. Serve with rose petal infused honey or sugar. Use to sweeten tea and as an ingredient in healing spa scrubs. In a small, wide-mouth canning jar, add about an inch of sugar. Add a layer of fresh, dried rose petals; pour enough sugar to cover leaves. Place another layer of petals, cover with sugar, then alternate layers of rose petals and sugar until the jar is full. The sugar will be highly fragrant from absorbing the essential oils from the leaves. See page 130 of The Herb Lover’s Spa Book for a floral sugar scrub recipe. Use as a fragrant body powder or to freshen stored linens, musty suitcases and the inside of shoes. Pat leaves and rose petals dry and allow to wilt overnight before adding to the powder mix. Mix together rice flour and cornstarch in a bowl. Place one geranium leaf in the bottom of a glass canning jar and just enough cornstarch/rice flour mix to cover the leaf. Add a layer of rose petals, top with cornstarch flour mix and alternate the layers until the jar is full. Cover and set aside for one week. Shake well. Sift out the rose petals and scented geranium leaves. Mix in rose geranium oil, stir well and place in a glass shaker jar.